The bounty of fresh summer produce is so inspiring. The beauty of this season is that creating healthy and delicious meals is super simple and is really all about showcasing natural flavours. 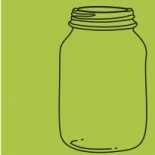 Take kohlrabi for example. My parents had one the size of a softball bursting out of the soil crying “eat me” last week. A quick search led me to a Mario Batali book where I found a recipe for kohlrabi al forno. I simplified the recipe a bit (mainly just omitting cheese). The result wowed my dad and I. Toss the kohlrabi with a little olive oil, fresh sage from the garden, salt and pepper and a little garlic and throw in the oven for 20 minutes. Delish!! Adding onion to the mix is fantastic too. 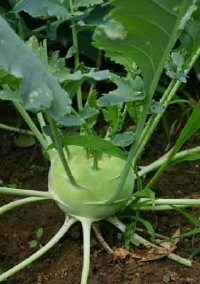 You can also enjoy kohlrabi raw with a nice dip or throw it in a stir fry. Your body will thank you – kohlrabi is part of the cruciferous vegetable family known to support detoxification and fight cancer. Pretty good for such a strange looking vegetable! That is the weirdest looking thing!! This entry was posted on July 20, 2012 by katelivingfull in Nutritional info, Savoury Recipes and tagged dairy free, garlic, gluten free, vegetarian.